I am very particular about my coffee. I love Dunkin original hot and Starbucks Iced. I have owned a variety of coffee makers from 60 dollars to the 2500 Jura and everything in between including Kitchen Aide, Bunn, Nespresso and Keurig. I am looking for a cup of coffee similar to Dunkin Donuts. None of the above even come close. 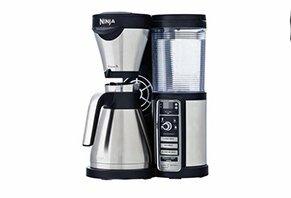 I purchased the Ninja Coffee Bar and have done a side by side comparison of a Starbucks iced coffee purchased directly at Starbucks and then made an ice coffee on the ice coffee setting using that coffee. The result was that I could not tell the difference! Tomorrow I will be comparing a Dunkin Donut coffee purchased at Dunkin and then making a hot coffee with its packaged coffee. Hoping for the same results..
We bought this coffee bar about two months ago from Sam's club. We had heard lots of good things about it, but my experience with this coffee maker was not a good one. Instead, actually just cost more money in the long run because we now have to return it and it's on the customer to pay for that, as stated In the warranty. At first the coffee maker seemed to work great, we would set it to start brewing in the morning time before work. After about two months we noticed it would only make a little amount of coffee and start beeping 5 times, we had to keep pushing the button to start it brewing again. It took about 40 minutes just to finally make a pot of coffee. After I emailed customer service to get some answers, all they told me was to clean it with this descaling solution then run water through a few times. After all was said and done, I realized the descaling solution did not fix the problem. So really just leads to more phone calls to customers service, where finally they decide to send a new one but informed me I'll pay 20 dollars for the defected product to be shipped and once they get it, they send out a new one. At the end of it all I ended up with a coffee pot that doesn't work. The coffee pot is more of a pain then anything. Between buying the descaling solution, customer service calls, and paying to have the coffee pot mailed back, I would never recommend this product to anyone. It was a big mistake, would of been better off getting a 10 dollar coffee pot. Did you have it on the full carafe setting?